Dialect: Se t eves ben, te perdones dut, se to odies no te perdones nia. Translation: If you love, you forgive; if you hate, you forgive nothing. Dialect: Vardavene da n om che fila, da na femena che scigola e da la bocia de n cian. Translation: Beware of a man who spins, a woman who whistles and the mouth of a dog. Proverbs courtesy of Filo Magazine: A Journal for Tyrolean Americans. Visit Filo for a fascinating glimpse into our ancestral arts, culture, cuisine, history and much, much more! Dialect: A pagàr e a morìr se fa simper en temp. Translation: To pay and to die, one does in time. Dialect: Colazion bonora, disnàr a la so ora, a zena ‘n pochetòt, se te vòi viver tantòt. Translation: Early breakfast, a punctual lunch, and light supper for a long life. Our printing company (Redbubble) that provides the Genetti family tree prints found in our online shop, will be holding a sale on Sunday, January 17 through Monday, January 18. Want to hang a beautiful ancestral family tree on your wall? Or give it as a gift to your own descendants? Now’s the time to take advantage of this great sale! Redbubble is offering 15% off of all products, Jan. 17th and 18th. Just use the checkout code GEEKOUT when you place your order to receive this super 15% discount! Don’t miss out! The discount applies to all family tree prints, fine art prints of our family coat-of-arms and even beautiful scarves printed with the Genetti crest. It’s time to wrap-up the series I began a month ago. In the process of researching connections between the Genetti, Zambotti, Dallachiesa and Marchetti families, the photograph that began the entire inquiry now comes into focus as a wonderful snapshot of sibling/cousin relationships. Let’s take a closer look at our ancestors and how their lives are intertwined. 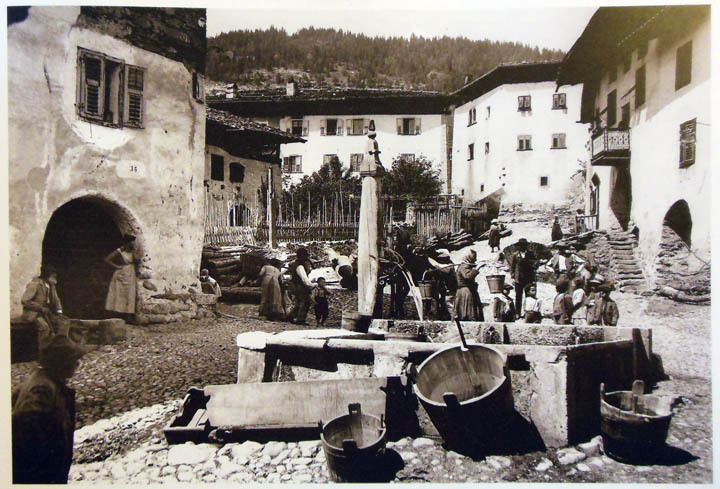 First – the boarding house/saloon where the photograph was taken, is owned by Raffaele Genetti and his wife, Lucia Zambotti. The group photo commemorates a double wedding that took place in 1906. #1 – Silvio Genetti is the oldest son of Raffaele and Lucia (owners of the establishment). He is the 1st cousin of #2 – Peter Zambotti, #4 – Dora Genetti Bott, #7 – Tillie Genetti Zambotti and #8 – Peter Dallachiesa. #2 – Peter Zambotti is holding Silvio’s hand. Peter and Silvio are 1st cousins because Peter’s father is Lucia Zambotti Genetti’s brother. Therefore Peter is the nephew of Raffaele and Lucia Genetti. He is also the cousin of #2 – Dora Genetti Bott, #7 – Tillie Genetti Zambotti and #8 – Peter Dallachiesa. #4 – Dora Genetti Bott is the niece of Raffaele and Lucia because her father is the brother of Raffaele and her mother is the sister of Lucia. She is the sister of #7 – Tillie Genetti Zambotti and the 1st cousin to #1 – Silvio Genetti, #2 – Peter Zambotti and #8 – Peter Dallachiesa. #5 – Richard Fedrizzi is one of the grooms in this wedding photo. He is the sibling of # 9 – Virginia Fedrizzi Dallachiesa and #12 – Joseph Fedrizzi. His wife is #6 – Angeline Cologna. The Fedrizzi family is from San Biago, Trento – not Castelfondo. #6 – Angeline Cologna Fedrizzi is the bride of Richard Fedrizzi. Her mother was Rachele Yannes. She most likely is the cousin of #14 – Florence Yannes. #7 – Tillie Genetti Zambotti is the sister of #4 – Dora Genetti Bott, the niece of Raffaele and Lucia Genetti, and cousin to #1 – Silvio Genetti, #2 – Peter Zambotti and #8 – Peter Dallachiesa. In 1911, Tillie and Peter Zambotti are married. #8 – Peter Dallachiesa is the second groom. His mother, Maria Zambotti, and Lucia Zambotti Genetti are sisters. He marries #9 – Virginia Fedrizzi. Peter is the nephew of Raffaele and Lucia Genetti, and the 1st cousin of #1 – Silvio Genetti, #2 – Peter Zambotti, #4 Dora Genetti Bott and #7 – Tillie Genetti Zambotti. #9 – Virginia Fedrizzi Dallachiesa marries #8 – Peter Dallachiesa. She is the sister of #5 – Richard Fedrizzi and #12 – Joseph Fedrizzi. #10 – William Dona is most likely related in some way to #15 – Josephine Dona. #12 – Joseph Fedrizzi is the sibling of #5 – Richard Ferdrizzi and #9 – Virginia Fedrizzi. #14 – Josephine Dona is most likely related in some way to #10 – William Dona. #15 – Florence Yannes is probably the cousin of #6 – Angeline Cologna Fedrizzi (Angeline’s mother was Rachele Yannes). She is also the 1st cousin of #17 – Angeline Marchetti Genetti because her mother, Philomena Marchetti, and Angeline’s father, John Marchetti, are siblings. #16 – Nela Recla (Leonela Erminia Recla) is the niece of Raffaele and Lucia Genetti because her mother, Angela Maddalena Genetti, is Raffaele Genetti’s sister. She is the 1st cousin of #1 – Silvio Genetti, #4 – Dora Genetti Bott and #7 – Tillie Genetti Zambotti. She is also cousins through marriage to #2 – Peter Zambotti and #8 – Peter Dallachiesa. #17 – Angeline Marchetti Genetti marries the nephew of Raffaele and Lucia Genetti, Leon Genetti, in 1914. She is the 1st cousin of #15 – Florence Yannes. Through marriage she becomes the sister-in-law of #2 – Peter Zambotti, #4 – Dora Genetti Bott and #7 – Tillie Genetti Zambotti. There are a few people in this photograph that I am unable to verify their relationship to the bridal couples: #3 – St. Clair, #10 – William Dona, #11 – Max Martini, #13 – John Springhetti, and #14 – Josephine Dona. Considering the connections stated above, I’m sure a cousin relationship will eventually be found for these as well. This series began with the inquiries of three cousins: Arleen Dallachiesa, Melissa Stidom and Erin Johnston, who did not know each other when they wrote me. Their ancestors came together over a hundred years ago to celebrate two weddings. I know many of you reading this post can also claim ancestral connections to those portrayed in the photograph, as can I. At times, the research for this series gave me a headache! I created many diagrams to keep the relationships straight. Around each turn there was a new discovery. Often I wandered if our ancestors were aware of their extensive interconnections. Were they as boggled by their cousin bonds as I was? And to think, this is only a tiny part of our family’s long and winding road of genealogy. Many thanks to Arleen Dallachiesa, Melissa Stidom, Erin Johnston and Don Lingousky. Your contributions of information helped piece this complicated ancestral puzzle together. 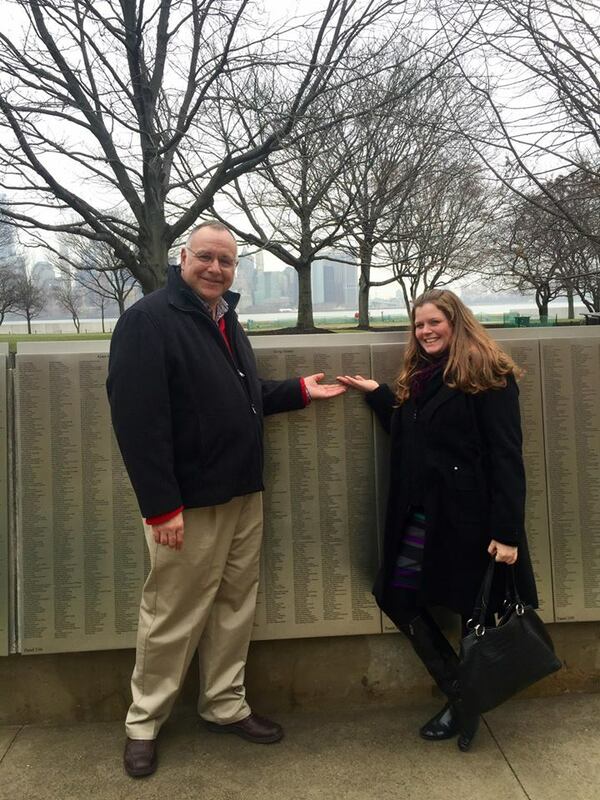 Thank you to William Genetti and Morgan MacDonald for sharing photos of their recent visit to The American Immigrant Wall of Honor located on Ellis Island in New York City. The Wall of Honor is a permanent monument depicting the names of our ancestors who came to America as immigrants, traveling through Ellis Island. 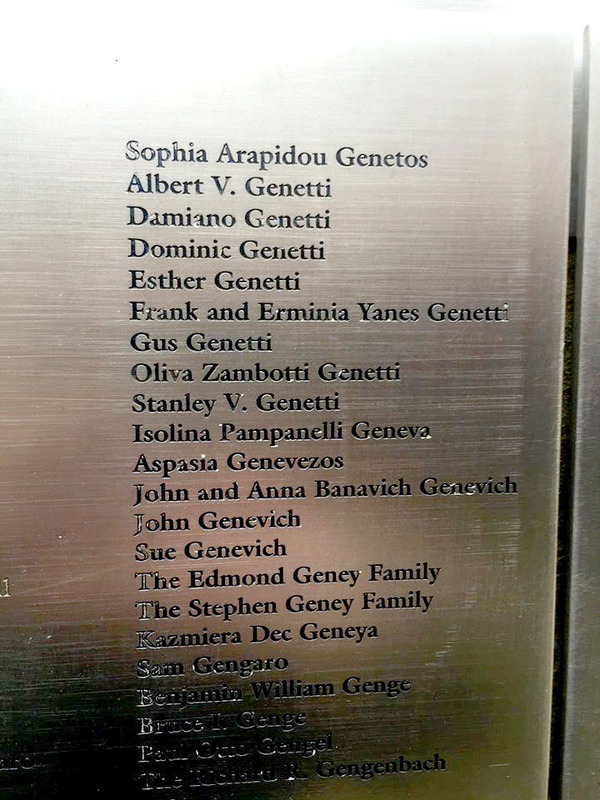 Listed on the wall are William’s grandfather, Gus Genetti, and his great-grandparent’s, Damiano Genetti and Oliva Zambotti Genetti, along with great-aunts and uncles. I have to admit, this gave me a little shiver of pride to see the names of my ancestors memorialized on this wall, (Damiano and Oliva were also my great-grandparents). I’ve added one of William’s pics to our Photography Page – take a hop over there to browse our extensive family archive! Interested in learning more about The American Immigrant Wall of Honor? Click here to visit the Ellis Island Foundation. Thanks again William and Morgan. What a perfect contribution to our family archive!